Come and enjoy our Macadamia and banana tour! 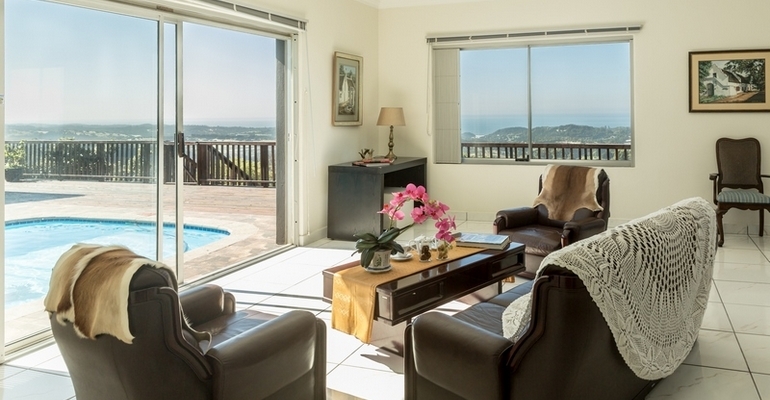 This ultra-modern luxury Villa on the magnificent KZN South Coast offers 6 carefully and uniquely designed en-suit bedrooms that are wheelchair friendly, sleeping 12 guests in total. Villa Doré's inspiration springs from a fusion of African, Asian and classic European decor and culture, offering you tranquil and private accommodation. We also offer Wi-Fi in an upmarket, open plan setting, with a dining, bar and lounge area. Outside there is a spacious deck and sparkling pool looking over the estate's Macadamia and Banana Orchids, surrounded by stunning sea views that make you feel on top of the world! Our facility is located on a banana and macadamia nut farm overlooking the town of Port Edward. We can do macadamia nut tours and you can also fish in the dams. We have a cycle path through our farm also. There is a nature reserve with hiking paths and bird watching. You can see the fossils along the beach and boat cruise along the beautiful gorge. Our neighbour is beaver creek cafe that does coffee tours. These are all in 10 minutes drive!!! There is so much to do and see here! !